One of the ideas featured in the project RePrezentacje. New Education is the ethics of care and the empathy that goes with it, which became political categories in the contemporary humanities discourse. According to an American researcher and feminist activist Carol Gillligan, both care and empathy are linked primarily to women’s way of thinking and feeling. In the patriarchal order of power, they are perceived only as an accessory to the superior category of justice, and dismissed. Gilligan claims that care is neither female or male, but human. It consists of the combination of “reason with feelings, the self with relationships” – without these relationships, there can be no building of democratic society. Why are mindfulness exercises an obligatory element of a designer’s everyday life? When designing the world, we bring to life not only matter (buildings, items, interactions), but we also create situations, rituals and experiences. We touch upon the sphere of emotions, memories and desires. To create consciously and responsibly, empathy must reach the highest levels. Empathy is co-feeling – sharing the emotions of other people, the world, and oneself. It makes us social beings: we create codes and rituals that, through cyclical repetition, provide identity and security. To understand the world and fellow humans, first, one needs to feel. During the panel discussion, we will take a look at empathetic practices of designers and artists. 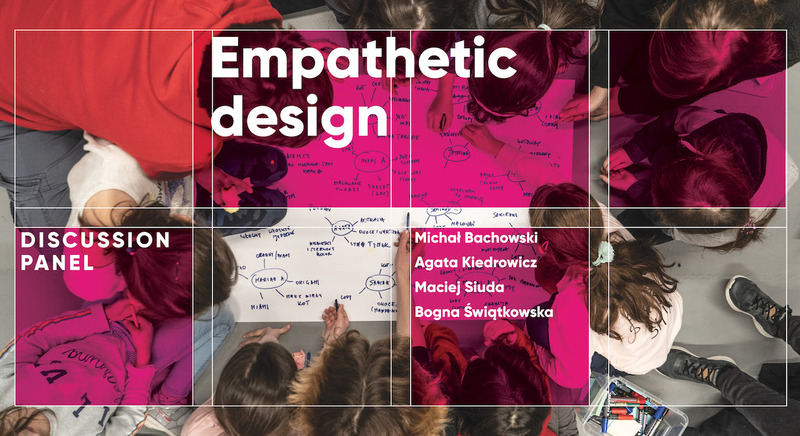 We will also summarize current results of the research and workshop work with children and youth conducted for the last several months by Agata Kiedrowicz and Maciej Siuda as well as educators from the Ujazdowski Castle Centre for Contemporary Art – Aleksandra Rajska and Iga Fijałkowska.